My husband, Jason Graham, grew up in a family of five children. He attended Thomas Jefferson High School in southeast Denver and then Metro State. His father, Tom, played football in the NFL from 1972-78. But Jason’s first love was basketball. At 6’7”, Jason could frequently be found somewhere on a court – either trying to make baskets himself or watch a Nuggets game. [Pictured on left: Michelle, Jason and Kendall Christmas 2010 in the hospital]. I attended Bear Creek High School in Lakewood. After high school, I received a scholarship to a small Christian college in Chicago where I lived for six years before returning to Denver. Growing up, my mom, Bev, worked long hours for little money as a church secretary and my father was a self-employed gemologist and “Mr. Mom.” I did not pay a lot of attention to sports – my favorite activities were writing, traveling, and rock hunting with my dad. Jason and I met online and then at a movie theater in 1996. Despite our differing life experiences, we quickly fell in love and were married two years later. Like a lot of young couples, we dreamed of having two kids, buying a home with a white picket fence, traveling a couple times a year to some exotic location, and then eventually retiring to someplace warm. We seemed to be on our way to realizing some of our dreams when I gave birth to a healthy baby boy in Dec 1999 and Jason found a good job in L.A. the following year. But in Oct 2002, everything changed. Like many wives, I was happy that I had finally convinced Jason to go to the doctor for a checkup. However, routine blood work showed that Jason had a problem with his kidneys. A biopsy confirmed FSGS, an incurable form of kidney disease. Less than one month later, Jason began having severe headaches. After five visits to the emergency room in six days, Jason was diagnosed with a pituitary brain tumor. As a 29-year-old man, this seemed like devastating news. Jason had successful brain surgery in Feb 2001, but his kidneys continued to slowly deteriorate. He still managed to work full-time, but he had little energy for much else. So I took on increased responsibilities even though I was having my own health problems including three miscarriages, failed infertility treatments, chronic daily hives, hair loss, weight gain, severe muscle pains, and several minor surgeries. It wasn’t until moving to St. Louis in 2005 that I was finally diagnosed with an autoimmune disease. I frequently worried about the future. What would happen if Jason lost his job? Or his insurance? Would the income from my job be enough? What would happen if I became too sick to work or take care of the family? How would we ever afford a house and provide our son with stability? And how would our son learn to do things like play ball or ride a bike when Jason could not even make it to the park with him? Jason, on the other hand, was determined to remain positive and put his trust in God. In Dec 2006, Jason received a kidney transplant from his mother, Marilyn. Within a few weeks, the transplanted kidney began to slowly fail once again. So Jason began searching for another donor. In Oct 2010, he was planning to receive a second transplant. Instead, he was unexpectedly diagnosed with a mass in his brain called PTLD, a rare type of lymphoma caused by his transplant drugs. Jason is currently undergoing chemo treatments to try to fight this disease and has been unable to work. Throughout our struggles with illness, Jason and I have continued to focus on our careers, raising our son, volunteering with various charities, and advocating for affordable health insurance for families dealing with severe chronic illnesses. By telling our story, we hope to encourage others dealing with similar circumstances – and perhaps touch the hearts of those who do not. 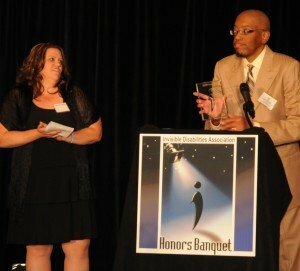 Jason Graham was the recipient of the 2010 IDA Inspiration Award! In addition to Jason’s amazing story of courage in the midst of a brain tumor, kidney transplant and ongoing complications, Jason has done volunteer work for his brother Daniel’s incredible organization, the Daniel Graham Foundation. Daniel is also currently a member of the Denver Bronco football team, #89 TE. UPDATE: We regret to inform you that Jason passed away on April 2, 2011. Our thoughts and prayers are with the Graham family. Read full story. Michelle Graham is an IDA Publications Contributor. Her husband, Jason, has battled a pituitary tumor and kidney disease since the age of 29. Although he had a successful brain surgery, his first kidney transplant began to fail within a few weeks. During these years, Michelle found out she had an autoimmune disease and underwent several surgical procedures. Jason was planning a second transplant in 2010, but was diagnosed with a brain mass (PTLD -rare type of lymphoma caused by transplant drugs) and has been undergoing treatment. Jason and Michelle have a son named Kendall. Jason was the recipient of the 2010 IDA Inspiration Award. Jason’s father, Tom, played in the NFL in the 70’s and his brother, Daniel, currently plays for the Denver Broncos. Thank you for sharing your story, Michelle! Your family has been through so much and still has such a long road ahead. Our thoughts and prayers are with you all. I can’t imagine the struggles you and your family go through on a daily basis. You and Jason have done an amazing job raising your son, Kendall is such a great kid. Your strength and courage are inspiring! What a great idea! This will save you lots of time and keep everyone updated and praying. Jason & Michelle, my thoughts & prayers are with you and Kendall. I know that both of you are fighters.